Comparison between the theatrical version (rated R) and the canadian Extreme Version (unrated). Both versions are on the Canadian RC1-DVD from Alliance Atlantis as well as the US-DVD from New Line Cinema. This unrated version joins the likes of "Underworld" or "Hellboy". Although there are some added fight scenes, this version is not necessarily a more violent one. Besides some gags and an alternative ending, the main part of the added scenes are plot-wise. The Extreme Version is 9 minutes and 25 seconds longer than the theatrical version! 04:04 Min. - 06:44 Min. The TV-Show with Dr. Vance and Chief Vreede already appears here and is much longer than the later version in the theatrical version. All parties continue to discuss vampires in general and then Blade in particular. In exchange there is the intro to the scene with the explosion of the storehouse. One can see shots of the city and the rising moon, then of a mouse running around the storehouse and passing an explosive charge, detonating briefly afterwards. Difference: Unrated 128 sec. longer. Then in the theatrical version is the TV interview, but shorter than in the unrated. 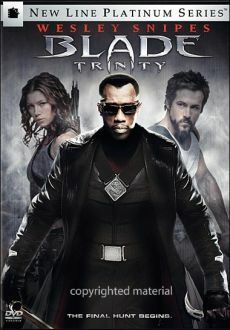 Everything is missing but the talk about Blade and even that is incomplete. The transition as in the theatrical version is missing in the unrated, too. Blade watches the interview on TV when Whistler brings him the newspaper. Difference: Theatrical version 64 sec longer. 18:45 min. - 19:26 in. The vampire-gang does tricks with the BMX-Bike and the skateboards. They are in search for their lunch and catch sight of Abigail. Difference: Unrated 41 sec. longer. Abigail walks briefly longer over the bridge in the theatrical version. Afterwards there is a shot from earlier in the unrated version, when the vampire-gang sees Abigail. Difference: Theatrical Version 2 sec. longer. 26:19 min. - 26:26 min. Dauer: Unrated 7 seconds longer. 27:57 min. - 28:27 min. In the unrated, the two cops make fun of Blade and his "phantasm" about vampires. The transition is different in both versions. Difference: Unrated 26 sec. longer. 29:10 min. - 31:42 min. The interrogation by Dr. Vance takes longer and is shown in different shots. Vance only makes fun of Blade in the unrated version by talking about wax teeth in his childhood and by imitating a cape in front of his face. Difference: Unrated 79 sec. longer. 45:36 min. - 46:31 min. Hannibal tells much more about Dracula and shows his collection of historical artefacts. He tells about his origin, myths, Bram Stoker, movies etc. In the theatrical version he only says "He´s real, Blade!" Difference: Unrated 51 sec. longer. 49:24 min. - 49:30 min. The salesgirl demonstrates a farting Dracula-doll. In the theatrical version there is a brief shot of Drake. Difference: Unrated 5 sec. longer. 49:32 min. - 49:37 min. The line "We´ve got just about anything" appears in a different shot, in the theatrical version it is said off-screen. Difference: Unrated 2 sec. longer. 49:45 min. - 49:59 min. The salesgirl gets a Dra-Cola from the fridge, presents it and puts it back. Difference: Unrated 4 sec. longer. 63:08 min. - 63:16 min. Hannibal tells a joke about lesbian vampires. Difference: Unrated 8 sec. longer. 65:26 min. - 67:17 min. Conversation between Danica und Drake. One learns more about Danicas religious origin. Then he bites her in order to make her a better vampire. Difference: Unrated 111 sec. longer. 74:40 min. - 75:39 min. Summerfield feels her way longer through the corridors and finds a bloodsplattered basketball. Zoe appears behind her. The blind woman screams at her to run away and take cover. Thereafter Zoe is shown as she hides in a ventilaton shaft. Difference: Unrated 59 sec. longer. 79:22 min. - 79:48 min. Abigail sneaks longer through the corridors in search of Zoe and eventually goes upstairs. 79:51 min. - 80:04 min. Abigail longer searches the rooms. Difference: Unrated 13 sec. longer. 87:00 min. - 87:33 min. Instead of the short answer "It already has" to Blade´s instruction not to turn the anger inside, Abigail briefly speaks about the sadness inside her and that she draws her power from it. Difference: Unrated 30 sec. longer. 91:49 min. - 91:51 min. Abigail puts on her jacket. 91:56 min. - 91:58 min. Abigail fixes her gloves under her sleeves. 92:01 min. - 92:02 min. Abigail´s arm with the device she just strapped on. Difference: Unrated 1 sec. longer. 92:03 min. - 92:06 min. Bullets, then an alternative shot of the "Boomerang". The theatrical version of this shot runs slower. Difference: Theatrical Version 4 sec. longer. 92:16 min. - 92:28 min. Abigail again as she puts on her leg armor. Then a longer shot of Blade as he gets the "Boomerang" when in contrast the end of the scene is longer in the theatrical version when he puts it away. The following shots are in the same order of weapons but always a few frames longer in the theatrical version. 92:31 min. - 92:38 min. In the unrated, the shot of the DayStar is in the beginning a little longer and in the end considerably shorter. Afterwards there is a shot of Abigail in the unrated version (while there is one of the DayStar in the theatrical version) as she takes the DayStar (which happens later in the unrated version). Then Blade only takes the silver stakes in the unrated version. Difference: Unrated 3 sec. longer. 92:40 min. - 92:45 Mmin. After he took the first stake in his side pocket, the shot gets interrupted in the unrated version and one can see Abigail taking the DayStar-arrow. Afterwards Blade is shown from a different angle putting the other stakes in his pocket. The shot, in which the DayStar-arrow is turned, is longer in the theatrical version. 92:47 min. - 92:49 min. 92:51 min. - 92:54 min. In the theatrical version the camera pans around Blade. Then Abigail additonally puts the left earphone in her ear. Difference: Theatrical Version 7 sec. longer. 102:48 min. - 102:56 min. Hannibal, lying on the floor, fends off the attack of the wrestling-vampire with his legs, throws him to the floor in a salto and strikes a blow at him. The theatrical version proceeds when the vampire grabs his throat. Differnce: Unrated 8 sec. longer. 103:40 min. - 103:45 min. Hannibal ducks under the blow of the wrestling-vampire and strikes several blows at the vampire´s chin. Dauer: Unrated 5 sec. longer. Alternative ending: Instead of Drake, Blade lies in the unrated version in the crater. 112:41 min. - 112:50 min. Shots of the cops, doctors etc. Difference: Unrated 9 sec. longer. 112:54 min. - 113:17 min. In the theatrical version people want to operate on Blade who reveals himself as Drake. In the unrated version, Blade awakes and sorts out the doctors in a fight sequence. The unrated version is 9 minutes and 25 seconds longer than the R-Rated theatrical cut.